Ensures that the screw no longer flies from the screwdriver! Simply pull your tool and it is magnetic. You can even use your screwdriver on the head comfortably without you constantly flying down the screw. The tool is just as quickly demagnetized. This is especially useful when you for example working on sensitive electronic components. The 2in1 helper is great for steel blades and tools such as pliers, allen, tweezers, Torx keys and much more. 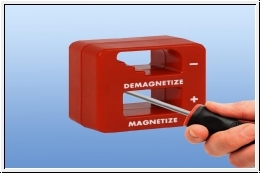 "+ opening" for magnetizing "- Opening for degaussing Very easy to use.